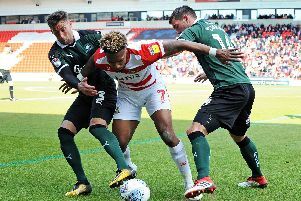 Grant McCann says Paul Taylor is unfortunate not to have featured more for Doncaster Rovers this season. And he has backed the 31-year-old forward to come good despite a ‘stop-start’ first few months at the Keepmoat Stadium. Taylor has been limited to two starts, in the Carabao Cup and Checkatrade Trophy, and eight substitute appearances since arriving at the club in the summer. McCann described the former Bradford City, Peterborough United and Ipswich Town frontman as a ‘special talent’ capable of lighting up League One before signing him on a one-year deal. Taylor produced his best performance yet in a Rovers shirt in Tuesday night’s 2-0 win over Grimsby Town in the Checkatrade Trophy. “He hasn't had a chance,” said McCann. “Unfortunately for Tayls, Coppinger, Wilks and Marquis have been playing really well and Alfie May’s been doing really well coming off the bench. “Tayls was going to start a game on a weekend and he picked up an injury on a Friday. “He’d been on the bench and then he had a little sickness bug that he couldn't shake off. “So it’s been a little stop-start for Tayls. “But I know what he's got and what a player he can be when he’s fit, and he's sharp and strong. Meanwhile, McCann was pleased to see Will Longbottom come off the bench against the Mariners following a lengthy spell on the sidelines. The 19-year-old forward last appeared for Rovers 13 months ago. “I’ve been really impressed with Will since he came back from injury,” said McCann. “He’s a strong boy and he loves those one-on-one situations, which you saw on Tuesday night.